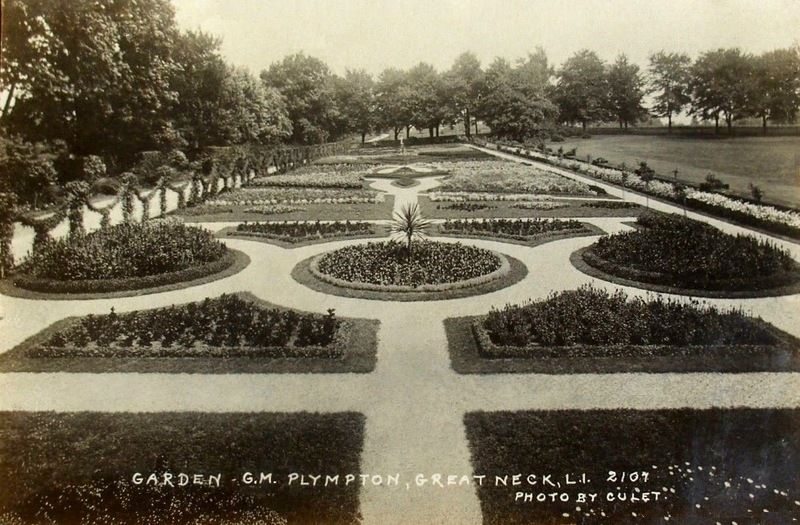 In the gardens of 'Wyndtryst', the George Plympton estate built c. 1898 in Great Neck. Click HERE and HERE for more on 'Wyndtryst'. These "bedding out" schemes,much beloved by the late Victorians and Edwardians were a labor intensive nightmare to maintain: in the fall, the soil would have been dug out and replaced, and tens of thousands of spring flowering bulbs would be planted. And when the bulbs had finished flowering in the spring, they would be dug out, the soil replenished and all of these annuals planted - to be watered and weeded for the remainder of the season. Fashion and practicality consigned this sort of gardening to the dust heap by the 1920's. For those interested, Waddesdon Manor, a former Rothschild house now open to the public in Buckinghamshire, England, still follows this procedure for its amazing gardens- a sort of living museum of garden design. "Pretty" may not be the adjective that springs to mind, but "astonishing" certainly is, and that was probably always the point of these sorts of landscapes. And in terms of design, this a good example of just putting something on the ground, as opposed to a more sophisticated fitting in of a formal design. This is basically like spreading a pretty rug on the lawn. And ditto to magnus' comments about waddesdon(where the design is integrated); the bedding displays are astonishing-- and surprising to those raised in the Beatrix Farrand/Gertrude Jekyll style of garden design, which swept away all this.